There's a simmering global crisis that should worry every single American—but it's not even breaking the surface in the media. Watch renowned intelligence and geopolitics expert Dr. George Friedman pull back the layers to uncover a ticking time bomb no one is talking about. Simply press play to watch Dr. Friedman's eye-opening interview with Mauldin Economics' Ed D'Agostino now! The biggest shockwave of this crisis has yet to hit... When it does, it will rock European society as we know it, affecting crucial transatlantic institutions and economies worldwide. Today, an exclusive report from Geopolitical Futures discloses important information about what this shockwave and its fallout means for investors and informed citizens alike. Claim your free copy right now. Yes, I’d like to subscribe to Dr. George Friedman’s free weekly newsletter, This Week in Geopolitics. Germany is the powerhouse of the EU and its beating heart, as well as being the fourth largest economy in the world. But the truth is, the Germans are facing a profound crisis—and there's no way they can prevent it. When the storm hits, its effects will be felt in the US and around the globe. 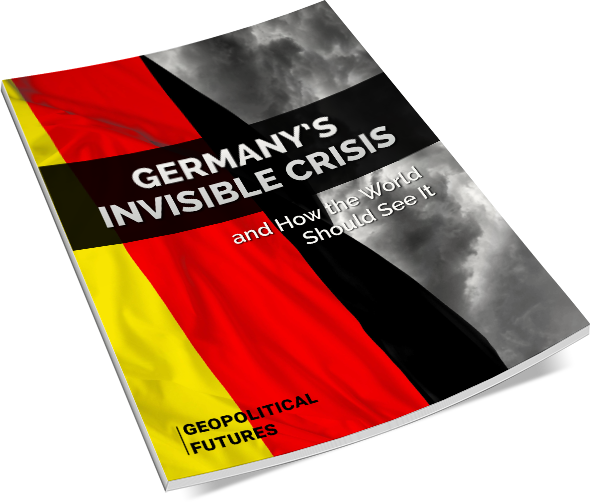 Investors worldwide will be left running for cover… But you can get an early warning and be prepared with this special report from Geopolitical Futures, Germany's Invisible Crisis and How the World Should See It. Reading this report could be the most important thing you could do to safeguard your family and your investments in the years to come. Get Germany's Invisible Crisis and How the World Should See It now by entering your email address above! Your privacy is important to us. We will never give your email address to third parties. As our thank-you gift, you will also receive Dr. George Friedman’s This Week in Geopolitics, a weekly letter covering his unbiased assessment of the global outlook and the forces that are developing, which will drive events and investors in the next year, decade, or even a century from now. If you want to stop receiving this free e-letter, you can opt out at any time. Mauldin Economics gives its subscribers access to some of the brightest minds in economics and investing, uncovering tomorrow’s trends and market leaders that make today’s smart investment choices. Dr. George Friedman is an expert in intelligence and international geopolitics. His unmatched analysis in geopolitics has led him to regularly brief senior commanders in the US armed services, the US Army War College, the National Defense University, the Pentagon, NATO’s Allied Command Operations, and the RAND Corporation. He has authored several New York Times bestsellers, including The Next 100 Years. He also founded the geopolitical intelligence consulting firm Stratfor in 1996 and is now the founder and chairman of the geopolitical forecasting service, Geopolitical Futures. Copyright © 2016 Mauldin Economics. All Rights Reserved.